Jokes on resolutions of digital outputs like 1080p or 4K aside, the Hi-Resolution Model line (Henceforth referred to as HiRM) of Bandai’s successful Gunpla model kits is one of the newest entry in the 1/100 scale, introduced back in late spring of 2016. The first 2 entries to the line, Gundam Barbatos and Wing Gundam Zero Custom, drew a slew of criticism due to the looseness and brittleness of the outer armour pieces, most likely due to separate production process of the inner frame assembled in China while the runner produced in Japan, causing incompatibility between the two. 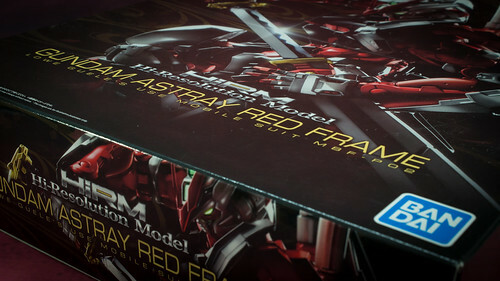 However, the 3rd entry to the series, the HiRM Astray Red Frame, pretty much rectified many of the flaws present in the previous entries, slowly gaining praises and renewed interests from builders all around. When first announced, many builders including myself condemned the idea of a super-buffed Astray, due to its overall design getting a lot of beefy parts, along with more muscle mass added to the inner frame. It appears the design principal of the kit is based upon accurate depictions of how muscle move around on a human body. As time went by, I’m beginning to accept the HiRM line as it is, an alternate depiction of your standard design that amplifies the beauty of the original. Although the original design of a Gundam Astray is supposed to be a barely armoured unit with agility boosted to the extreme, the idea of it being a down-to-earth, highly skilled and experienced samurai in Mobile Suit form, is a welcome thought.